Return from walk (おでかけから　かえす) - This is the top (default) choice. It will take the Pokemon from the Pokéwalker and return it to the game along with all other Items, caught Pokemon and Watts. 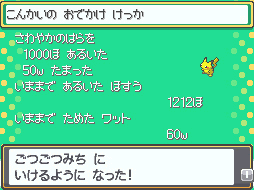 Receive Present (プレゼントを　うけとる) - This will not return your Pokemon to the game from the Pokéwalker, rather, it will return your Watts, caught Pokemon and items to the game and leave your Pokemon in the Pokéwalker. 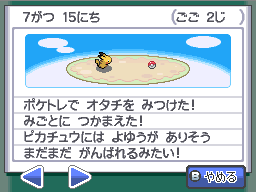 Go on a walk (おでかけに　いく) - This option is for putting a Pokemon from your box into the Pokéwalker. If a wild Pokemon takes over, you will not be able to use this option until you have returned it. Return from walk (おでかけから　かえす) - This option will take the Pokemon in the Pokéwalker out of it. If a wild Pokemon joins you when you have no lead Pokemon, you must use this button first and then use the 'go for a walk' button as listed above. Walking with a Pokemon that has an advantaged-type will bring the required steps to find a certain Pokemon down by 25%. 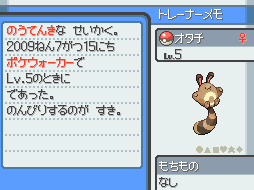 It also appears to make rarer Pokemon easier to find. Each Pokéwalker Route consists of three groups. Each of these groups have two Pokemon in them. 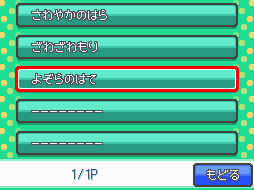 When a Pokemon is sent to the Pokéwalker, the Pokéwalker will randomly pick one Pokemon from each group. The Pokemon that did not get randomly selected within a group will not ever appear during that walk. Attack (こうげき) - [Left Button] Hits the opponent to lower HP. 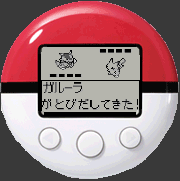 Catch (つかまえる) - [Center Button] Throw a Poke Ball in order to catch the wild Pokemon. Evade (かわす) - [Right Button] When the opponent Pokemon goes to attack, you can dodge it and do damage with a counter attack. This is the place to change either sound (left) or shade (right) settings. Sound has 3 different settings; Mute, Medium, Loud. To change the contrast just scroll through the contrast bar until you get the contrast you like.